Your cat is sitting in your lap, purring contentedly as you stroke him, when he suddenly bites your hand and jumps down. What happened? He has begun to doze in your lap, wakes suddenly and is momentarily disoriented by his surroundings and by being “confined” by your hands. After he jumps down he may look confused and begin to groom himself to calm down. 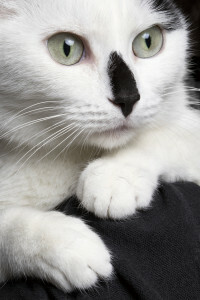 Sensitive or nervous cats can be overstimulated by prolonged petting. There are usually warning signs of the impending attack–restlessness, tail twitching, flattened ears, head turned toward hand. It is important for the cat owner to be alert to these signals and to stop petting the cat before this point is reached. At this time a small food treat could be given, along with a few more strokes, to gradually increase his threshold of tolerance. 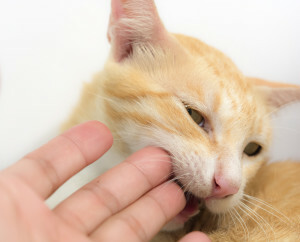 Never physically punish the cat for biting as it may cause him to become defensive and to more aggressively retaliate. Petting the cat’s sensitive stomach area almost always elicits a natural defense reaction which includes wrapping his paws around the person’s wrist, holding on, and biting. Cats vary in how much they like being petted or held by people. Cats that do not enjoy prolonged petting or being held may still play with their pet parents, follow them around the house, sleep on the bed with them, and even sit on their laps. All of these behaviors are indicative of attachment. Some cats are huggable and others are not, but both types of cats can be equally attached to their owners. Its really an individual cat tolerance behavior. We must respect their space and let it be their way. Except the cat for behaving like a cat.